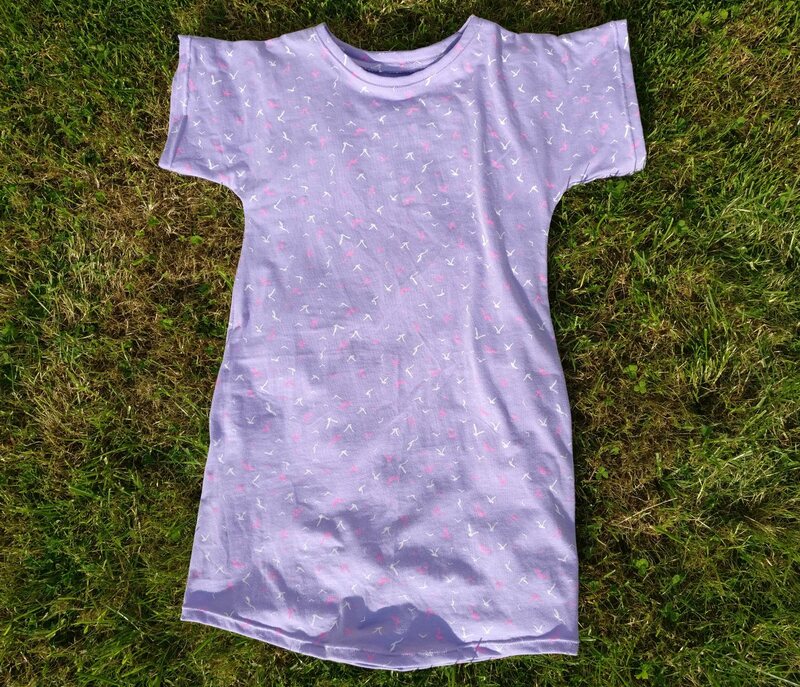 I looked through my pattern stash for a nightdress pattern, and realised that I could use the Petitboo Jasmine T-shirt (a free pattern) that I had downloaded about a year ago with the intention of making a t-shirt for her, until I realised that she had no need, nor desire for a t-shirt! 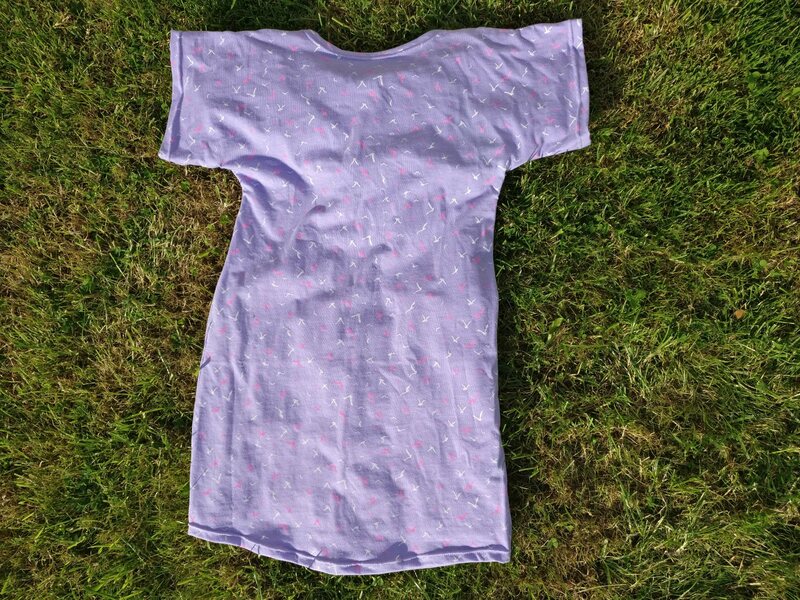 The Jasmine Tee is a simple round-necked tee with grown on sleeves and a curved hem. The sleeves actually have a folded cuff, and I started off intending to use this, but then my daughter tried it on as is, and declared that she wanted the sleeves to stay the same length. I also thought that folding the cuffs would add bulk on something that needs to be super-comfy. 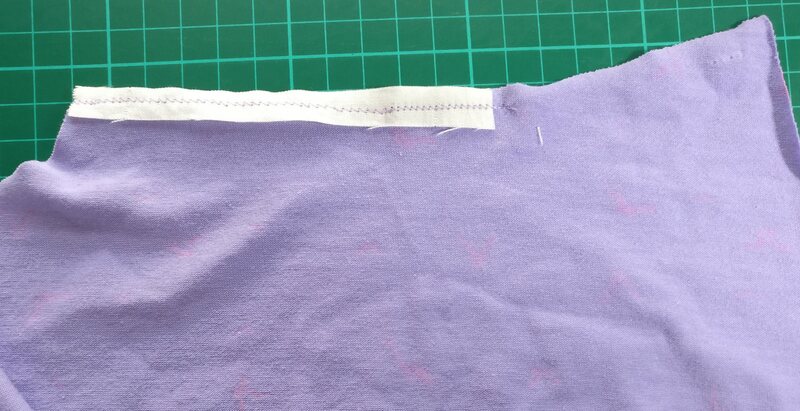 Pattern alteration was very simple – pretty much being a case of altering the length, I lengthened the t-shirt by approximately 20cm for my daughter giving some room for growth. 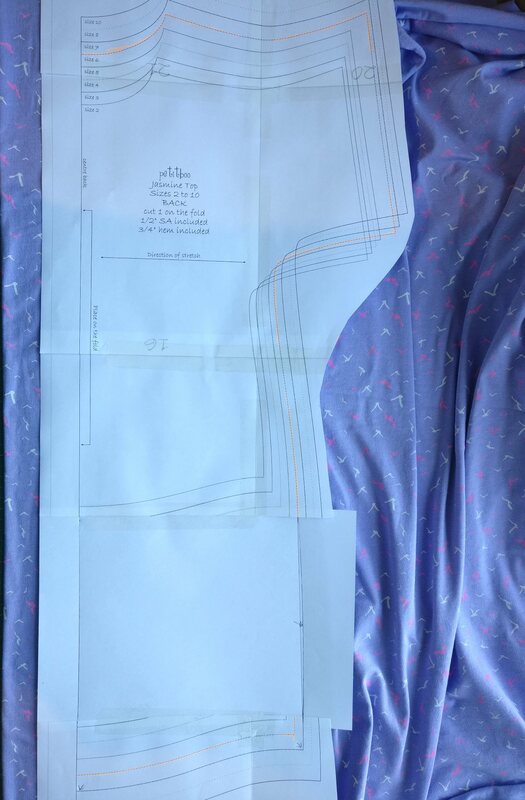 As the front and back pattern pieces are the same apart from the neckline I only actually altered one of them, then cut out the top half and overlaid the pieces to cut out the full length. In order to lengthen the hem I needed to use the next size up at the hem – purely because I wanted the nightdress to widen slightly rather than be the same width all the way down. Construction is incredibly easy – attach the facing pieces to the neckline, clip the seams, sew the shoulder seams, sew the side / underarm seams, finish if required (I didn’t bother – the jersey doesn’t fray, and because it is a narrow seam allowance, there’s not even a need to clip under the arms 🙂 ) See what I mean? It’s so easy 🙂 Not only is it easy, but it’s also remarkably quick. Admittedly, it took me about a month from deciding on the project to actually completing it, but as I have already mentioned, some days I have very little time for sewing, and other days I have no time, so that’s much more to do with me than the pattern itself! 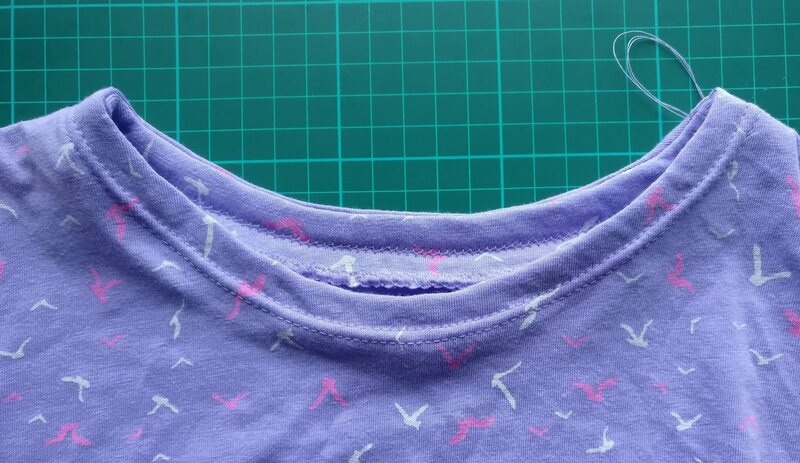 I did move away from the instructions, as I sewed the shoulder seams before sewing the facings in to the neckline. I sewed a little strip of selvedge from a woven cotton fabric on to the back shoulder seam (not down the length of the arm, as at this stage I thought I would still be folding for the cuffs) to stabilise the seams a bit as with the prima top I made myself last year. I didn’t bother folding the cuffs as my daughter liked the sleeves the way they were, and I was a little concerned about adding bulk on something that needs to be super-comfy. I’m not sure what else I can say about this; construction was straightforward, using lightning stitch (a narrow zigzag). 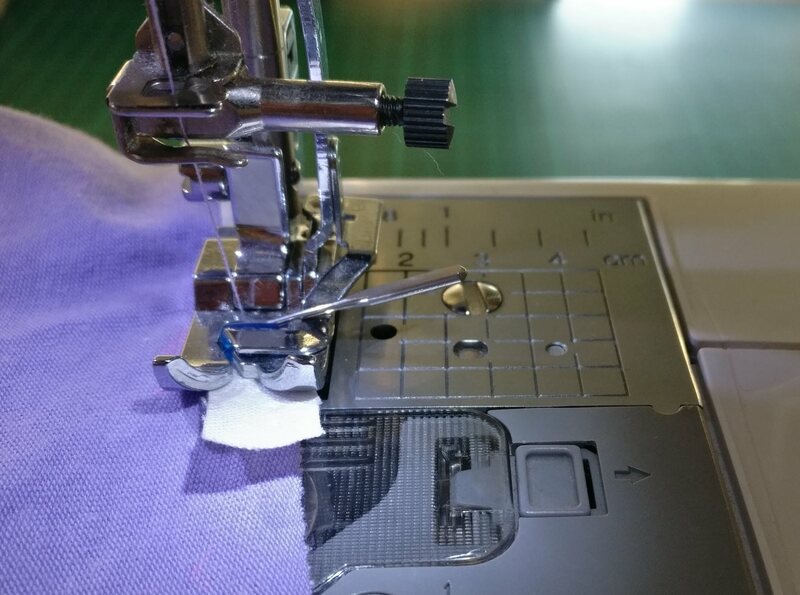 Hemming was again easy – I used a twin jersey needle and went slowly…I’m not sure I need to go slowly, but I have found in the past that stitches were skipped when I went faster. That though, was a good while back, when I had less practice and it was using a different fabric, so maybe I need to use some of the scraps to practice going a bit faster! Next Next post: It’s Beginning to Look a Bit Like Christmas!